When Shrek makes a dodgy deal with Rumpelstiltskin, he finds himself trapped in a topsy-turvy world where ogres are hunted, Rumpelstiltskin is king, and no-one even knows his name! 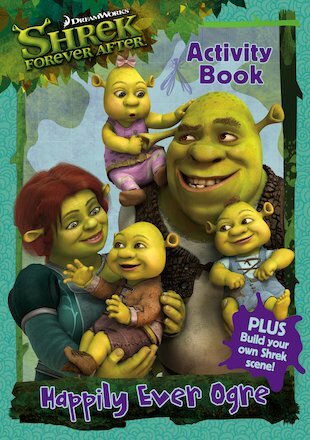 Can you help Shrek to escape and reclaim his one True Love with this book of awesome activities? Test your knowledge of Far Far Away with a Shrek quiz. Look through Rumpel’s magic mirror. Help Shrek to find his way out of a forest maze. Packed with fabulous fun from Shrek’s latest adventure – puzzles, games, creative ideas and more – this book of take-away fun includes a stunning Shrek scene to build!